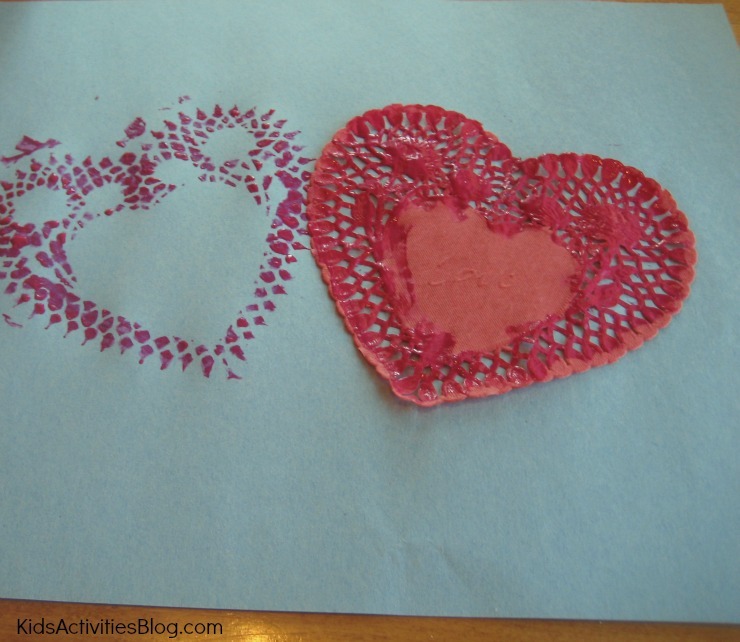 Looking for an easy Valentine craft? 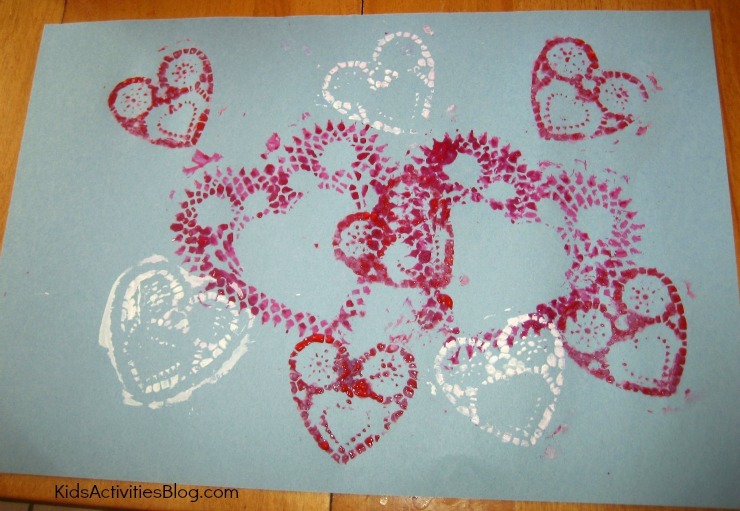 This printmaking activity is simple but super cute and kids love it. Kids Activities Blog loves that it sneaks in some fine motor activity for those little developing hands. Valentine’s Day is about sharing love with others. Printmaking is one object sharing its pattern with something else. This simple craft combines both kinds of sharing. It uses only four materials to create a piece of art that could be used as a place mat, folded in half to make a card, or simply hung on the wall. It is so easy to do that even younger children with some assistance would be able to do it. Place one of the doilies at a time on the construction paper. Apply paint to the cutouts in the doily . This can be done by dabbing paint on cutouts with a paintbrush or brushing it across the doily. When you have covered the doily, with the amount of paint that you desire carefully lift the doily off the paper. If you are going to continue painting with the same color, you can place the doily somewhere else on the paper. If you are going to change colors, place a clean doily down on the paper before you start to paint. There isn’t a right way or wrong way to arrange the doilies on the paper for painting. We just randomly put the on. Sometimes they overlapped previously created hearts and sometimes they were on their own. Sometimes my son painted the whole pattern on the doily and sometimes he painted the outside edge. He did have a little trouble lifting up the wet doilies from the paper. The process of lifting the doilies covered with paint became a mom assignment. In the end we didn’t get too many paint drips from my doily removal. 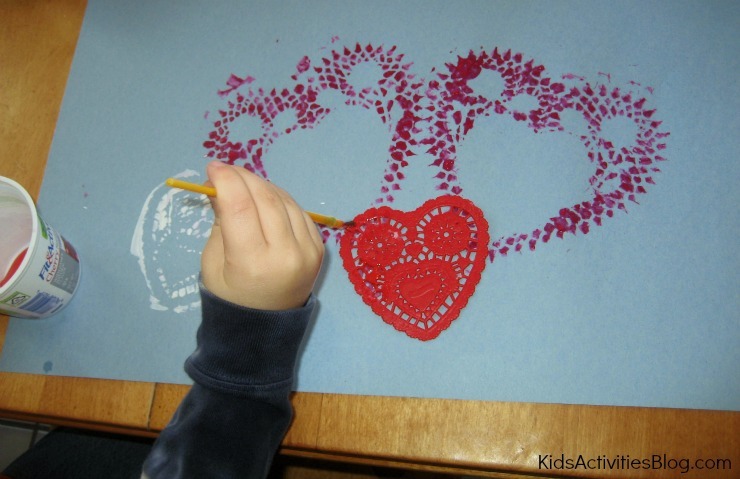 Painting or print making with doilies is great fine motor activity that involved holding a thin paintbrush in our case. If your children a younger than four, they may benefit from a thick brush. I think we ended up with a wonderful piece of art that my son and I are going to send to his uncle who is serving overseas. 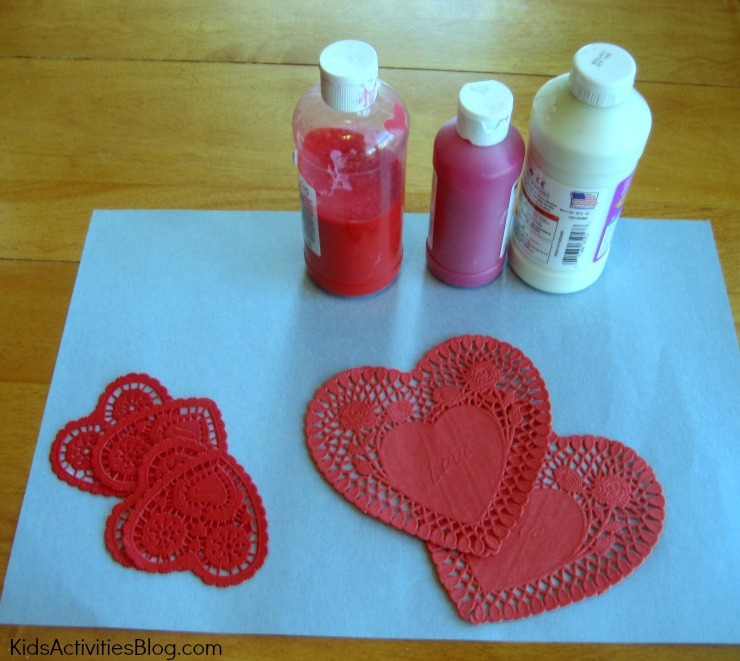 Don’t you love an easy Valentine craft like this? And printmaking for kids is a great activity for busy little hands. Fun! It might be fun to try dabbing the paint on with a little piece of sponge too! I think we’ll be trying this one! I think a small piece of sponge would be great to use in this project.